haunted decatur TOURS will return in october 2019! Downstate Illinois’ Original Ghost Tour will Return in 2019! It’s going to be another great year of true tales of ghosts, crime, murder, mystery, and mayhem, based on the book by Troy Taylor! Whether it's your first experience with Haunted Decatur or you're returning for another visit, 2019 will be another season NOT to miss! Mark your calendars! Tickets for the Halloween 2019 tours go on sale starting August 12, 2019! The Haunted Decatur Tours run either 3 or 4 hours in length -- depending on the tour - and travel by bus to various locations throughout the city. Each tour gets on and off the bus during the evening and we do go inside some of Decatur's most haunted locations. HAUNTED HISTORY TOUR: Our longest-running tour is a spirited bus tour that takes guests on a 3-hour excursion to Decatur's most haunted locations. Our "history tour with ghosts" reveals not only the highlights of the city's history, but also reveals the history "that no one wants you to know" -- from crime scenes, to scandals, unsolved murders, and more. Each tour gets on and off the bus throughout the night at the most haunted places in town and includes indoor locations, where you might just have the chance to meet a deceased Decatur resident face-to-face! GHOST HUNTER'S TOUR: Created in 2005, the extended Ghost Hunter's Tour is a supernatural bus trip with an extra hour of spirits, scandals and sins! More history, more hauntings, and more off-the-bus locations, this 4-hour tour delves into the most ghost-infested people and places in Decatur's history. We only offer a very limited number of these tours each season and it's one not to miss! If you'd like to see the "behind the scenes" drama of Decatur's haunted past, then this is the tour for you! Use the BOOK NOW button to make reservations for all Haunted Decatur Tours, or use the links in the schedule below! Tours will sell out quickly this year, so be sure to book your tours in advance! See you in Haunted Decatur! ARE YOU BRAVE ENOUGH TO EXPERIENCE HAUNTED DECATUR? The Haunted Decatur Tours are based on the bestselling book by Troy Taylor, HAUNTED DECATUR. The book includes an in-depth look at all of the locations on the tour, plus dozens of other tales of Decatur's ghosts, haunted houses, graveyards, murder scandals, unsolved mysteries and more! CLICK HERE TO GET AN AUTOGRAPHED COPY! From it's earliest days, the city of Decatur gained a reputation as a place where ghost stories were common -- from tales told by the settlers to haunted houses and hotels. But Decatur's dark origins can be traced back to the earliest days of the city, when the original settlers built over the top of Native American burial grounds that were scattered throughout the downtown area of what would become Decatur. The destruction of these burial mounds cast a mysterious pall over the city -- a darkness that continues to linger today. In 1854, Colonel Dan Conklin started a whiskey distillery, racetrack and brothel on the outskirts of Decatur, which would earn the city its first unflattering nickname of "Hell's Half Acre." It would go on to boast others, including the "Second Most Corrupt City in Illinois." 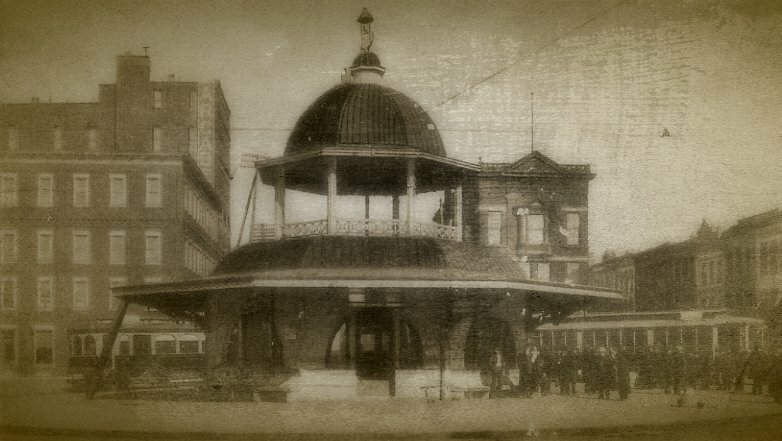 During the 1920s, Decatur would gain infamy as a place where murder, bootlegging, prostitution, kidnapping, gambling, corruption and, of course, ghosts, were commonplace. Now, join us for our award-winning tours of Decatur as we journey back in time to uncover the "other side" of the city's history and reveal not only the scandals and sins that haunt Decatur, but the many ghosts that linger here as well! Decatur's sordid reputation also added to the ghostly stories of the city through incidents of murder and death. Crime truly came to Decatur in the 1850s with the arrival of the railroads. Vice districts, gambling parlors and brothels sprang up in the wake of the railroads and the Civil War, bringing bloodshed and violence to the city. From lost burial grounds to haunted theaters, the Haunted Decatur Tour is much more than just a run-of-the-mill ghost tour! This is not just a collection of ghost stories, but a true history of how the city became so haunted -- which means we also include local sites of death, unsolved murders, strange crimes, gambling parlors, vice districts and more plagued the city in days gone by. We can promise that you'll never look at the city of Decatur in the same way again!